WASHINGTON—Putting the nation on alert against what it has described as a “highly credible terrorist threat,” the FBI announced today that it has uncovered a plot by members of al-Qaeda to sit back and enjoy themselves while the United States collapses of its own accord. “And unfortunately, based on information we have from intelligence assets on the ground, this plot is already well under way,” he added. A recently declassified CIA report confirmed that all known al-Qaeda-affiliated organizations—from Pakistan to Yemen, and from Somalia to Algeria—have been instructed to kick back and enjoy the show as the United States’ federal government, energy grid, and industrial sector are rendered impotent by internal dissent, decay, and mismanagement. According to statements made by top-level informants and corroborated by leading Western terrorism experts, if seen through to its conclusion, al-Qaeda’s current plot could wreak far more damage than the events of 9/11. In the past year, money transfers to al-Qaeda cells around the world have reportedly been accompanied by instructions to use the funds to outfit safe houses with the proper equipment to receive American cable news broadcasts and view top U.S. news websites, allowing terrorists to fully relish each detail of the impending demise of the last global superpower. 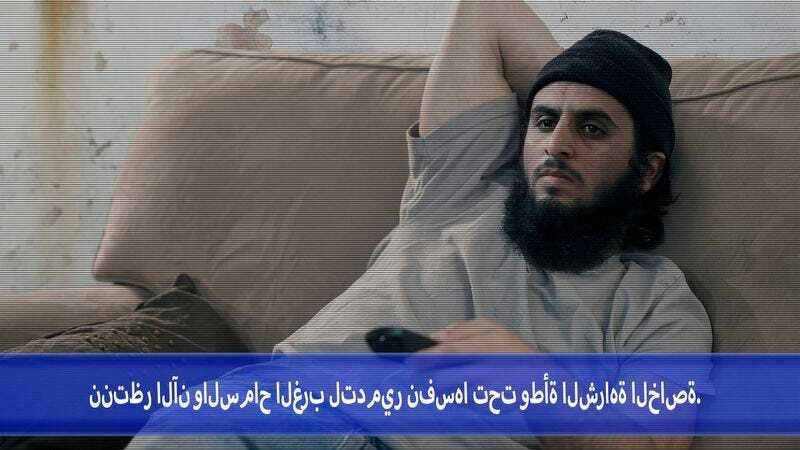 Additionally, FBI officials made public an internal al-Qaeda video today in which the terrorist organization’s leader Ayman al-Zawahiri chillingly exhorts his followers to “take a load off” and “unwind” in the name of jihad, and really cherish the victory over their enemy. “We vow that we will not cease sitting around and laughing it up until America is reduced to rubble,” he continued. Al-Zawahiri, who is seen in the video reclining back in his chair, putting his feet up, and flipping on CNN, later shouts “Allahu Akbar!” when a story is aired about the decade-long trend of stagnant wages among American workers. The FBI has also warned that numerous al-Qaeda agents may have established sleeper cells for the purpose of “getting a kick out of” the nation’s downfall on American soil. The bureau urged U.S. residents to use caution around schools, hospitals, legislative bodies, prisons, and other decaying institutions whose imminent failure terrorists may wish to observe up close. Speaking on condition of anonymity, one high-ranking U.S. counterterrorism official has described the present situation as a massive failure of intelligence. Responding to the allegations, a spokesperson for al-Qaeda reportedly confirmed the terror group’s plot and praised the American people as martyrs of the highest order.